Emory University professor Deborah Lipstadt founded the Holocaust Denial on Trial website to refute the misleading claims of Holocaust deniers. The website has been redesigned to coincide with the release of "Denial," a feature film about Lipstadt's legal battle against Holocaut denier David Irving. Emory Photo/Video. 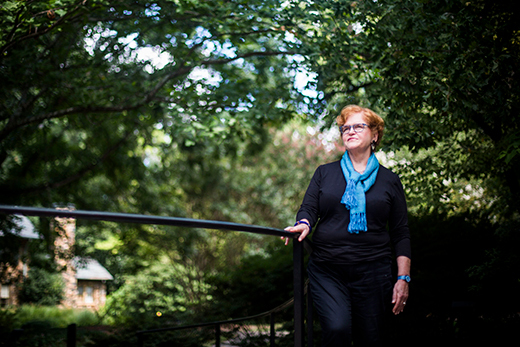 Holocaust Denial on Trial, a website founded by Emory University professor Deborah Lipstadt to refute the misleading claims of Holocaust deniers, has been redesigned and relaunched. Created in 2005 through a partnership between Emory and the university’s Tam Institute for Jewish Studies, the website catalogues the legal and evidentiary material arising from David Irving v. Penguin UK and Deborah Lipstadt, a libel claim brought against Lipstadt and her publisher in 1996 by Holocaust denier Irving. At the root of the case is the issue of historical truth. In her 1993 book “Denying the Holocaust: The Growing Assault on Truth and Memory,” Lipstadt, Dorot Professor of Modern Jewish History and Holocaust Studies, identified Irving as a Holocaust denier. Materials from the 32-day trial were posted on the Holocaust Denial on Trial (HDOT) website to provide perpetual access for scholars and the interested public and quality resources to combat Holocaust denial. Holocaust Denial on Trial debunks a wide variety of myths propagated by Holocaust deniers, including claims about the authenticity of Anne Frank's diary. Photograph by unknown photographer. 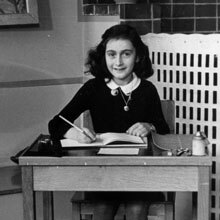 Collectie Anne Frank Stichting Amsterdam [Public domain], via Wikimedia Commons. “We knew there would likely be renewed interest in the trial, and we wanted to make sure that these materials are available to the public as widely as possible,” says Karen McCarthy, a doctoral candidate in philosophy and a digital projects coordinator with the Emory Center for Digital Scholarship (ECDS). The primary goal was to reorganize the massive court transcript — which ran over 8,000 pages — and affiliated trial material, essentially arranging the materials by topic to create a user-friendly table of contents for each day of the trial, McCarthy explains. Working with a team of eight Emory graduate students through the ECDS internship program, the lengthy transcripts were divided into short, semantic groupings so users can more easily browse them by names and topic. In addition to providing an online repository for trial transcripts, witness reports and resources for digital scholarly analysis, the site offers users the opportunity to review scholarly materials refuting frequent Holocaust denial myths. Work on the redesign began in March and was intensive, providing graduate students not only a glimpse into the “informational architecture” of a digital resource, but also “a crash course in British law and Holocaust studies,” says Jonathan Potter, a doctoral candidate studying the New Testament within Emory’s Graduate Division of Religion, who worked on the project. In a blog about the experience, Potter describes how the original trial documents had initially been converted into text files, requiring users to scan through thousands of pages of documents. Potter notes that all trial materials are now available for download as text-encoded files for more advanced analysis.